alaTest on kerännyt ja analysoinut 30 arvostelut tuotteelle PANASONIC SC-AKX660E-K. Keskimääräinen antama arvosana tälle tuotteelle on 4.7/5, verrattuna keskimääräiseen arvosanaan 4.1/5 kategoriassa Audiolaitteet. Me analysoimme käyttäjien ja ammattilaisten antamia arvosteluita, tuotteen ikää ja muita seikkoja. Verraten muihin tuotteisiin kategoriassa Audiolaitteet, PANASONIC SC-AKX660E-K on saanut alaScore™-arvosanan 89/100 = Erittäin hyvä. This is a great wee music system, great value for money, amazing sound. 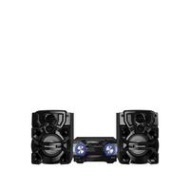 Very good stereo, great sound and quality. This is hooked up to my TV aswell works great. Love the look and the style. Ordered yesterday and arrived today. Outstanding piece of kit. The windows are rattling. Sounds absolutely superb. Great value for money. Slight downfall was the short speaker cables. Ordered an extension for a few quid, so I'm not too unhappy. Brought this a week and reaĺly pleased with it and great sound. For the price this is a great stereo. Very loud and has great features.